There exists a category of American cities in which the line between suburban and urban is almost impossible to locate. These suburban cities arose in the last half of twentieth-century America, based largely on the success of the single-family home, shopping centers, and the automobile. The low-density, auto-centric development of suburban cities, which are largely in the arid West, presents challenges for urban sustainability as it is traditionally measured. Yet, some of these cities—Los Angeles, Las Vegas, Phoenix, Salt Lake, Dallas, Tucson, San Bernardino, and San Diego—continue to be among the fastest growing places in the United States. 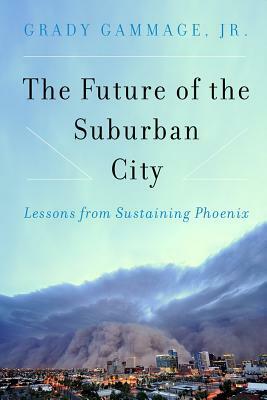 In The Future of the Suburban City, Phoenix native Grady Gammage, Jr. looks at the promise of the suburban city as well as the challenges. He argues that places that grew up based on the automobile and the single-family home need to dramatically change and evolve. But suburban cities have some advantages in an era of climate change, and many suburban cities are already making strides in increasing their resilience. Gammage focuses on the story of Phoenix, which shows the power of collective action — government action — to confront the challenges of geography and respond through public policy. He takes a fresh look at what it means to be sustainable and examines issues facing most suburban cities around water supply, heat, transportation, housing, density, urban form, jobs, economics, and politics. — Andrew Ross, author of "Bird on Fire"